Gaza's deadly escalation followed two weekly protests along the border fence with Israel, which saw no casualties. The bloodshed is likely to complicate the mission of the Egyptian mediators, who intensified their shuttle diplomacy to calm down and prevent a full-fledged conflict between Hamas leaders and Israel. 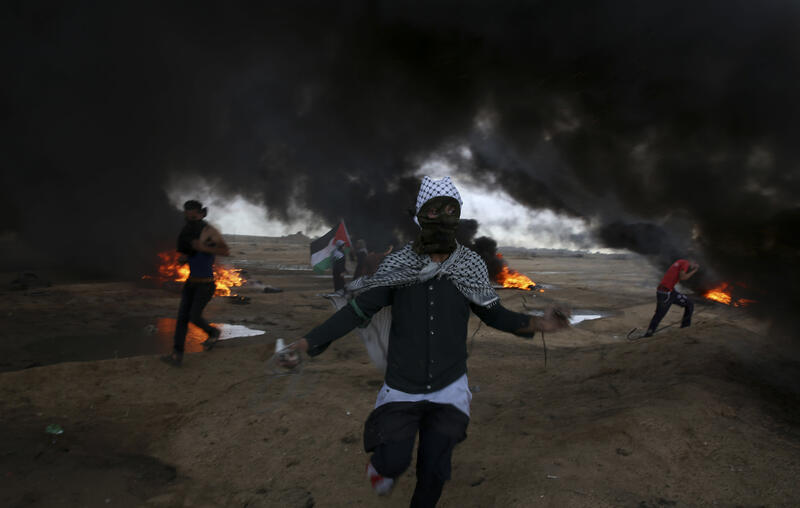 Previously, thousands of Palestinians gathered at five locations along the border, burning tires and throwing stones, grenades and firebombs at Israeli troops responding with tear gas and occasional fire. The Israeli army said some suspects briefly crossed the fence. In a separate incident, the military said its planes hit three Hamas military posts in the northern strip. According to the ministry, three of the dead were reported to be in Khan Younis in the southern Gaza Strip. Witnesses said that dozens of protesters approached the fence there. In the north of the Gaza Strip, a 27-year-old man died after being shot in the head, the ministry said. He added that 170 other protesters suffered various injuries. The militant Hamas group has reduced the deadly protests in the last two weeks as Egypt intensified its efforts to calm down. On Wednesday, Egyptian intelligence officials met with representatives of Palestinian factions in Gaza. Loay Qarouti, of the People's Front General Command for the Liberation of Palestine, said the mediators urged them to "protect the lives of protesters and minimize casualties among them." Egypt seeks to restore calm to Palestinian reconciliation between Hamas, Gaza conquered in 2007 and the administration of President Mahmoud Abbas in the West Bank. But Hamas claims it wants a paralyzing blockade imposed by Israel and Egypt on Gaza to isolate the Islamic movement. The blockade has made it increasingly difficult for Hamas to govern. The widespread distress among the Gaza Strip's 2 million residents, who only receive a few hours of electricity per day and inedible tap water, as well as increasing unemployment and limited freedom of movement, are hampering their participation in Hamas-organized protests. The demonstrations began six months ago, and at least 160 Palestinians who participated or participated in the protests were killed. A Gaza militant shot dead an Israeli soldier in July. Israel accuses Hamas of using the big protests as cover for border infiltration and attacks. It says it defends its border and accuses Hamas of exploiting young demonstrators and encouraging them to risk their lives to increase the pressure to ease the blockade. Israel stands under strong international criticism for what many see as excessive use of force and the large number of unarmed people being shot.